I had a hankering fro some chewy bread like substance tonight so I whipped up some of my 5-minute bread dough using 2 cups whole wheat flour and 4.5 cups of all purpose flour. I was thinking of the Roman pizza bianca which is typically a simple flatbread made with a high hydration dough topped with olive oil, salt and rosemary. I added a few other ingredients to this no-cheese pizza. The dough rose for about 3 hours before I took a hunk of it and stretched it out into a square. 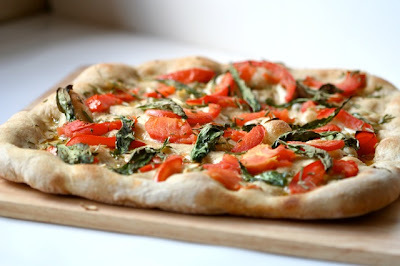 I doused the dough liberally with olive oil and topped it with sliced garlic, fresh rosemary, fresh tomatoes and arugula leaves. The whole shebang was sprinkled with kosher salt and baked in a hot hot oven until crisp and bubbly. It really hit the spot. Greetings my poor neglected food blog. It has been a while since I’ve posted. Yes, life gets in the way sometimes. But I’m traveling in Colorado now and just had to share this burger that I found at the Whistler’s Cafe in Nederland, CO. This is a charming old mining town just west of Boulder at the end of Boulder Canyon Drive. The views were spectacular and this burger was great. 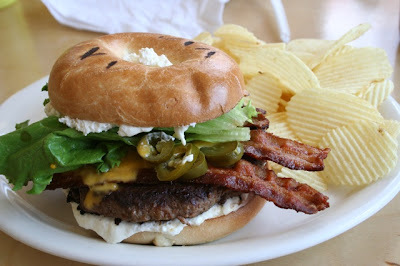 It starts with a bacon cheddar cheese burger kicked up with jalapeños and cream cheese served on a toasted bagel. It sure hit the spot for a very nice brunch at 8300 feet.